Northern Cyprus (officially the Turkish Republic of Northern Cyprus – TRNC) is the Turkish side of divided Cyprus Island in the Mediterranean. Secluded beaches, outstanding weather with year-round sunshine, natural beauty, ancient sites, old towns, picturesque harbours and great food make Northern Cyprus a popular destination for holidaying and buying home. If you consider retiring overseas, North Cyprus offers an appealing retirement option with low taxes, ease of residency and property ownership, and the excellent healthcare. All come together to make living on this Mediterranean island more easy and fun. Housing costs very depending on location, and are a lot cheaper than any other Mediterranean islands and European countries. The standard of living is comparable to that in Western Europe. Turkish is the official language; however, English is widely spoken. The population of Northern Cyprus is 350,000. Turkish Cypriots are very friendly and their history, culture and cuisine are intrinsically bound to this calm body of Mediterranean water. North Cyprus is a safe country for living. 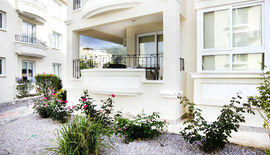 North Cyprus is a great base to buy a holiday home. Most holiday home owners rent their properties to family, friends or commercially to provide a valuable source of income for their long term holiday. North Cyprus also offers great opportunities for business investments. The recent tourism developments brought great value to the island. Most visitors choose North Cyprus villa rentals instead of hotels for their holidays as villa rentals provide more privacy, and are relatively cheaper. If you are moving to North Cyprus with your family, education for your children is the most important thing you would be seeking. North Cyprus has great value independent universities, colleges, junior and senior schools. Studying in North Cyprus is also very cheap compared to other European countries. In the recent years, North Cyprus received many visitors for medical treatments. Thanks to Near East University Hospital, one of Europe's leading health institutes with many awards including WORLDCOB 2013 Business Excellence Award, Dubai and 2013 Gold Quality Award of International Arch of Europe, Frankfurt. There are some other private hospitals with great healthcare.